Then decide on a motif. Draw it onto the background and isolate it using gesso or white paint. Finish by adding your own ideas and a quote. 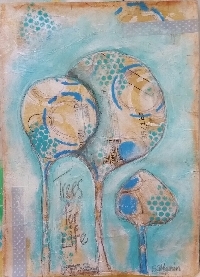 Hello Suzanne, I am feeling a bit dumb, did you use the tree shape in tissue, stencil etc then drew the said shapes again in gesso... then you redraw the trees,,,,,,, is that correct?